Concerned he would become forgotten in their vast minor-league system, Ted Williams rejected an offer to begin his professional career with the Cardinals. If he would have signed with the Cardinals, Williams likely would have been in their organization at the same time as Stan Musial, making it possible the 1940s Cardinals could have had two of the game’s best left-handed hitters, Musial and Williams, in the same lineup. Instead, Williams played two years with his hometown minor-league San Diego Padres of the Pacific Coast League before signing with the Red Sox. In his only World Series appearance, Williams opposed Musial and the Cardinals in 1946. In 1935, Williams was in his junior year at Herbert Hoover High School in San Diego. Playing mostly outfield and first base, he hit .588 in 15 games and also pitched, posting a 4-2 record. Herb Benninghoven, a scout for the Cardinals in San Diego, took notice of Williams, began attending his games and befriended him. On Aug. 6, 1935, the San Diego Evening Tribune reported Williams had been invited to try out for the Cardinals in St. Louis. It was the first public indication Williams was considered a professional baseball prospect. Williams still was 16 _ he would turn 17 a few weeks later on Aug. 30, 1935 _ and speculation was his parents didn’t want him to leave home yet. He didn’t attend the Cardinals tryout and instead returned to high school for his senior year. Meanwhile, the Yankees joined the Cardinals in pursuing Williams. The Yankees offered Williams a chance to play for their Oakland affiliate in the Pacific Coast League and, according to the Bradlee book, Williams and his family agreed in principle that he would sign with New York after he graduated from high school. Still, the suitors kept arriving, most notably the Tigers and the Pacific Coast League Los Angeles Angels. Also, Benninghoven and the Cardinals hadn’t given up either. In January 1936, in the middle of Williams’ senior year, San Diego was granted a franchise in the Pacific Coast League and the team was named the Padres. Soon after, Benninghoven, looking to sign Williams before he graduated, invited him to attend a Cardinals tryout camp in Fullerton, Calif. This time, Williams accepted. Branch Rickey, general manager of the Cardinals and originator of their farm system, was overseeing the tryout camp. The night before, Williams was hit by a pitch in the thigh during a game. At the tryout camp, his sore thigh hampered his mobility and Rickey was unimpressed by Williams, according to the Bradlee book. Still, because of a strong endorsement from Benninghoven, the Cardinals offered Williams a contract, but he spurned the offer. Money also may have been a factor in Williams’ decision to reject the Cardinals. Williams also turned his back on the Yankees and instead, with his parents urging him to stay home, signed with the Pacific Coast League Padres. 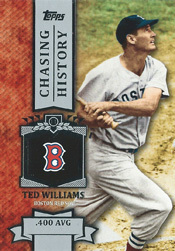 After two seasons with the Padres, Williams, 19, signed with the Red Sox in December 1937. After a year with minor-league Minneapolis, Williams joined the Red Sox in 1939 and embarked on a Hall of Fame career in which he would hit .344 with 521 home runs and 1,839 RBI in 19 years with Boston. In 1941, Williams hit .406, becoming the last big-league player to achieve a .400 batting average. Two years after Williams first appeared with the Red Sox, Musial, who had converted from pitcher to outfielder, debuted with the 1941 Cardinals and launched his own Hall of Fame career in which he would hit .331 with 475 home runs and 1,951 RBI in 22 years with St. Louis. Thanks much for your readership and for your support.